In my review for the Gatchaman Complete Collection, I wrote about how the show, which came to the U.S. as Battle of the Planets, was one of my childhood favorites. I still have great affection for the series, and I'm often disappointed when I don't see it mentioned amongst other anime classics. I have a daughter who is very into anime right now and when I mention Gatchaman or Battle of the Planets, I get very little response. (She did watch several episodes with me when I reviewed the Collection and I got the feeling that the show was too dated for her.) However, Sentai Filmworks, who released Gatchaman Complete Collection, has made some strides to keep the series relevant, as evidenced by their release of Gatchaman: The Movie. Is this the kind of thing which will make today's youngsters notice the show? The original television show, which was called Science Ninja Team Gatachman, ran in Japan from 1972-1974. 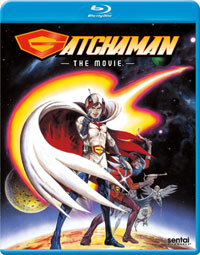 This Gatchaman: The Movie appeared in 1978, and one could easily assume from the title that it is a feature-length follow-up to the show, perhaps wrapping up some loose ends. But, it's not. In fact, this is a sort of greatest hits package in which several episodes of the series have been edited together to form a very loose narrative. As far as I can tell, Gatchaman: The Movie is comprised of: Episode 1, "Gatchaman Versus The Turtle King"; Episode 51, "Cata-Roller, The Revolving Beast"; Episode 52, "Red Impulse's Secret"; Episode 53, "Farewell Red Impulse"; Episode 103, "G-2 Risks Death"; Episode 104, "The Evil Grand Black Hole Operation"; and Episode 105, "Earth's Destruction! 0002". Clearly, the episodes offered here come from the beginning, the middle, and the finale of the series and throw several different stories at us. We see the Science Ninja Team - Ken (voiced by Katsuji Mori), Joe (voiced by Isao Sasaki), Jun (Kazuko Sugiyama), Jinpei (Yoku Shioya), and Ryu (Shingo Kanemoto) -- acting under the direction of Dr. Nambu (voiced by Toru Ohira) on their very first mission, as they must fight a giant mechanical turtle. The turtle is all part of an evil plan hatched by Galactor, a terrorist team lead by Berg Katse (voiced by Mikio Terashima), who is acting on the orders of an alien being known as Leader X (voiced by Nobuo Tanaka). Then, the story turns to Ken and a spy named Red Impulse (voiced by Hisayoshi Yoshizawa) teaming up to take down a small country which has sworn allegiance to Galactor. Little does Ken know that Red Impulse hides a secret which will change Ken's life. The last part of the "movie" is taken the series finale, as Joe, who is gravely ill, takes it upon himself to find Galactor's long-hidden headquarters and confront Berg Katse on his own. The rest of the team must follow him and attempt to put an end to Galactor once and for all. I’m not sure if the goal of Gatchaman: The Movie was to provide a send-off and a sense of closure for fans of the show or to act as a way of introducing the series to a new group of viewers. If it was the latter, then the movie succeeds as an introduction, but it fails as a cohesive and coherent one. We get some good action here, but we learn very little about the characters -- which is very important, as the individual personalities of the team members is a cornerstone of the show. In the end, Gatchaman: The Movie may simply come across as a confusing mess to those who don’t know the show. It was very cool to experience a “new” piece of Gatchaman lore (new in the sense that I didn’t know that this project existed), but it comes across as obsolete, as I can simply reach for the Complete Collection if I want to watch those episodes. Gatchaman: The Movie doesn’t contain enough “Fiery Phoenix” on Blu-ray Disc courtesy of Sentai Filmworks. The film is framed at 1.33:1 and the Disc contains an AVC 1080p HD transfer which runs at an average of 20 Mbps. The picture is sharp and clear, showing no overt grain. I’d expected some pretty obvious defects from the source materials, but we only get some mild white spots. The colors look very good and the image is never overly dark or bright. The picture is detailed, but it doesn’t reveal any issues with the animation. The Disc carries a DTS-HD Master Audio 5.1 track which runs at 48 kHz and an average of 2.5 Mbps. The track provides clear dialogue and sound effects. There is a very nice use of surround and bass effects here. It’s nothing overwhelming and it certainly doesn’t sound like a modern blockbuster movie, but there is enough there to make its presence known and to add to the overall viewing experience. The Gatchaman: The Movie Blu-ray Disc contains no extra features.